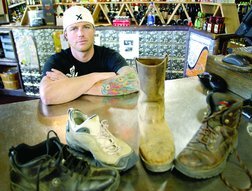 The owner of Wagon Wheel Liquors in Durango, Colorado, says he will comply with a police order to stop taking shoes from people he catches shoplifting in his store. Gabe Fidanque said he was frustrated because calling the police did not seem to do much good; some shoplifters were back in the store within hours of being arrested. So he came up with an alternative. "I give them the choice," Fidanque said. "I say ‘I’m either going to call the cops or you give me one of your shoes." About half a dozen shoplifters chose to limp away rather than be arrested. On May 26, Fidanque posed for a Durango Herald photographer with a selection of four shoes from his growing collection. But when the Durango Police Department heard about this, they told Fidanque to cut it out. The problem, said Captain Micki Browning, is that as they see it, a shoplifter who chooses to give up a shoe has been required to "surrender property through intimidation" — which is a form of felony robbery under Colorado law. (Shoplifting is only a misdemeanor.) Browning was quoted as saying, "What’s the difference between him saying, ‘give me $20 and I won’t call the police’ [and saying] ‘give me your shoe’?" "Give me your shoe" is funny, that’s what. And funny ought to be a defense. But it isn’t. On Friday, police ordered Fidanque to cease the shoe seizures and any other "vigilante-style punishments" immediately. He is also to try to return the shoes he has collected to their rightful owners, which Fidanque said he would try to do, but he was not expecting anybody to make a claim. "That’s the whole point of it," he said. "They’re too humiliated to come back and ask for their shoe, and that also means they won’t steal again." (Maybe, although shoe-store owners should probably be on the lookout.) "But it’s not worth jeopardizing my business," Fidanque said. "It was a good try, but I’ll have to figure something else out." On May 29, the Herald reported that Fidanque had been bombarded with requests for interviews, not only from Colorado stations but also from Fox News, the BBC, and a media outlet from Malaysia. He gave 40 interviews on Wednesday alone. The report also noted that so far, no one has claimed any of the three shoes Fidanque still has: one Herman work boot, size 7 1/2; one black Spalding sneaker, size 9; and one Stanley boot, size 11, with custom arch support.